The most potent musician in the development of the French opérette tradition in the 1870s, and for a decade the musical theatre’s most successful composer. Charles Lecocq was a sickly child, he has long been said to have suffered from an illness which left him with a permanent limp and the need to use crutches. It appears, however, that in truth his handicap was the result of his having been dropped, by his sister, whilst a baby. 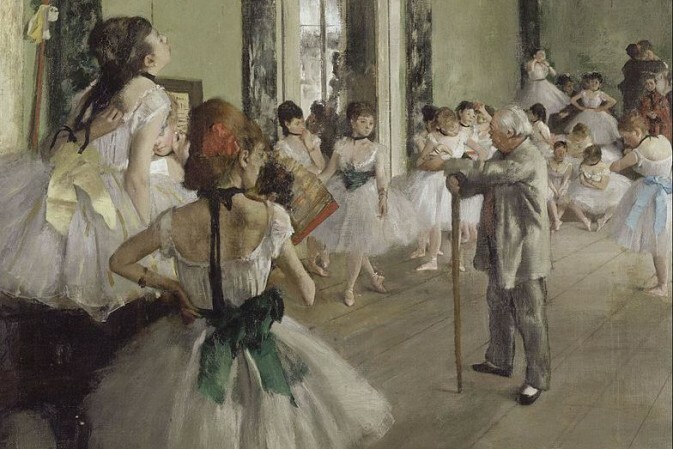 During his youngest years the physically limited boy developed the interest in music which led him to prefer a musical education to a general college one, and at the age of 16 he entered the Paris Conservatoire. The need to earn a living ultimately obliged him to give up his studies and devote himself to teaching and to work as an occasional pianist, but at the same time he made his first steps as a composer with a series of piano pieces. He was able to find a publisher for some of these, however, only when he pretended that they were the work of a fashionably German composer. The struggling young man first came to general notice as a composer at the age of 24 when his setting of a Léon Battu/Ludovic Halévy text called Le Docteur Miracle tied for first place with that by his Conservatoire contemporary, Georges Bizet, in a contest organized by Offenbach for the Théâtre des Bouffes-Parisiens. The winning pieces were produced at the Bouffes, and Lecocq’s stage career was launched. That launching was, however, to prove to be a very slow one. Although he continued to write regularly for the theatre and, during the next 15 years, succeeded in placing as many pieces — principally one-act opérettes but also several longer pieces — on the Paris stage, Lecocq did not manage to force his way through to a position in the first rank of opérette composers. The most substantial and successful of these early pieces was the three-act oriental opéra-comique Fleur de thé (1868), mounted at the Théâtre de l’Athénée, under the management of the eccentric William Busnach, the same producer who had given Lecocq — whom he had engaged on the music staff at his short-lived theatre — his first opportunity with a larger piece, a couple of seasons earlier. 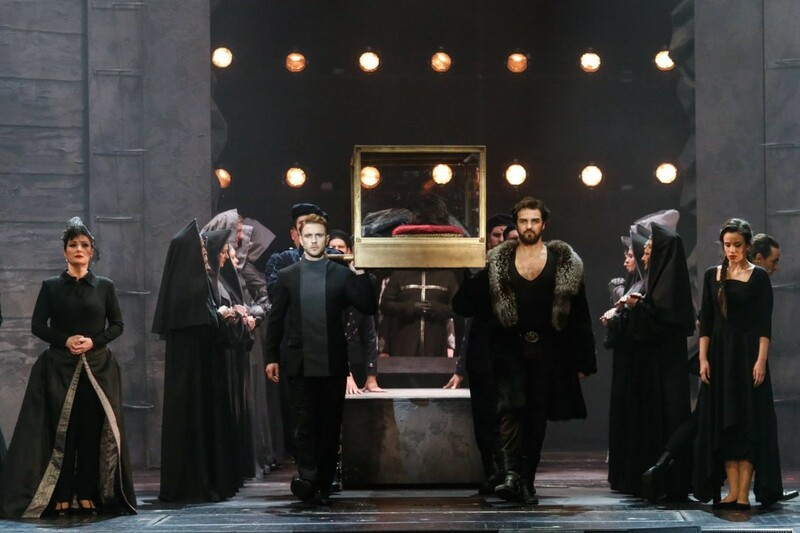 The two-act L’Amour et son carquois had been a semi-success which had been sufficient to win him a libretto from the rising Chivot and Duru, recently the librettists of Hervé’s Les Chevaliers de la table ronde. The swingeingly saucy Fleur de thé was given a good Parisian run in its unfashionable little house and, at the height of the fashion for French opéra-bouffe, it went on to be played in most of the main theatrical centres of the world. Lecocq’s name and reputation had begun to get around, but in a theatrical world where star composers were made within years of coming out of short pants and the Conservatoire, he was already heading for his 40th birthday. Thereafter, however, his works began to win more attention. Three short pieces produced at the Théâtre des Bouffes-Parisiens — Gandolfo, Le Rajah de Mysore and Le Testament de M Crac — were given productions throughout Europe and occasionally beyond, and the two-act Le Beau Dunois went on from its Paris production to be played both in Vienna and in Budapest, where it was the first of Lecocq’s works to be produced. However, Lecocq still had to struggle for commissions and productions, and the closest he got to a new production in Paris was the announcement that he was to write a new opéra-bouffe, entitled Gésier XIV, with Jules Moinaux for the Folies-Dramatiques. Apparently because of legal complications, Gésier XIV was never produced, and it was not until the Franco-Prussian War encouraged Lecocq temporarily to quit Paris that he found the opportunity that would set him on the road to real international success. His fourth collaboration with Chivot and Duru, and this time with the famous vaudevilliste Clairville as well, was Les Cent Vierges, an extravagantly comical piece of musical farce writing which was accepted for production by the enthusiastic Eugène Humbert at Brussels’s Théâtre des Fantaisies-Parisiennes. Splendidly mounted, Les Cent Vierges was a grand success in Belgium, and within two months of its first Brussels performance it was transferred to the Paris stage before being exported world-wide (To The Green Isles Direct, The Island of Bachelors, Hundert Jungfrauen, Száz szüz etc). A second piece for Humbert, La Fille de Madame Angot (1872), was even more successful. A combination of a splendidly shapely libretto and a score which offered one sveltely melodious song and ensemble after another, it went swiftly to Paris and then around the world several times. On the way, it proved itself internationally as the most consequent work of the period, and it firmly and finally established Lecocq and his light comic-opera style of writing at the forefront of the French and international musical theatre scene, in place of the outrageous frivolities of the pre-war opéras-bouffes of Offenbach and Hervé. The success of La Fille de Madame Angot and Les Cent Vierges sent theatre directors off in the same kind of spin searching for more Lecocq works that they had earlier displayed in chasing Offenbach pieces.. They dug back and, in London for example, where the new rage burned brightest, his Le Carnaval d’un merle blanc was produced in a botched version as Loo, or The Party Who Took Miss, whilst such short pieces as Les Ondines au champagne (Folly, 1877), Le Rajah de Mysore (Gaiety, 1878) and Gandolfo (Drury Lane, 1878) were given belated first showings. Less scrupulous directors fabricated their own Lecocq opérettes from music pilfered from his old works. The composer’s next piece, Giroflé-Girofla, was also produced in Belgium. A delicious comic opera, much more in the old-fashioned, low-comic vein of Les Cent Vierges than in the dramatic and historic/political mode of La Fille de Madame Angot with its true-to-life characters, it proved a third consecutive international hit for Lecocq. With the Parisian theatres crying out for the services of the composer of La Fille de Madame Angot and Giroflé-Girofla, Lecocq — after an aborted start on a fourth show, Le Grand Frédéric (w Prével, Saint-Albin) for Humbert — now returned to France. There, his first new works had a mixed reception. A distinctly more polite and rather old-fashioned comic opera, Les Prés Saint-Gervais (1874), written to a text by Sardou and Philippe Gille and produced at the Théâtre des Variétés, had neither the comic flavour nor the drama of his more popular pieces, but, after a disappointing Paris run, it nevertheless followed its predecessors on to the international circuit (Prinz Conti, Conti herceg etc). A bandit piece, Le Pompon (1875) was firmly rejected by the Paris public, but it too won some exposure away from home (Tivolini) and scored a long-lasting success in Hungary where, as A kis doktor, it was given a respectable first run at the Király Színház and remained more than 15 years in the general repertoire. 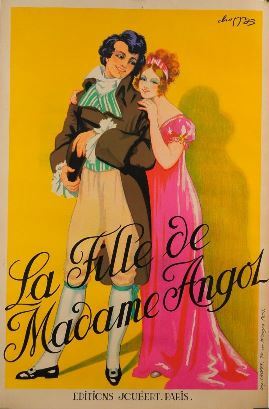 Latter day poster for ” La Fille de Madame Angot”. Following these two less-than-wholly-successful pieces, Lecocq teamed up again with his La Fille de Madame Angot collaborator, wheeler-dealer Victor Koning, who was now spending his vast royalties on being the director of the Théâtre de la Renaissance. 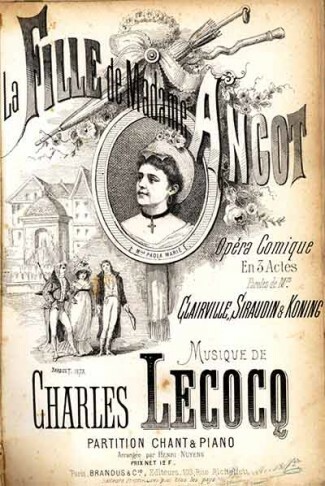 Over the next six years Lecocq composed, Koning presented, and the reigning queen of Parisian opérette, Jeanne Granier, mostly starred in eight new opéras-comiques, beginning with La Petite Mariée (1875), peaking with Le Petit Duc (1878) and including such other internationally played pieces as La Petite Mademoiselle, La Marjolaine, La Jolie Persane and La Camargo. These Théâtre de la Renaissance shows, written to texts by a variety of librettists and lyricists, were a remarkably consistent body of works musically and they confirmed Lecocq’s position, through the 1870s, at the head of his profession. 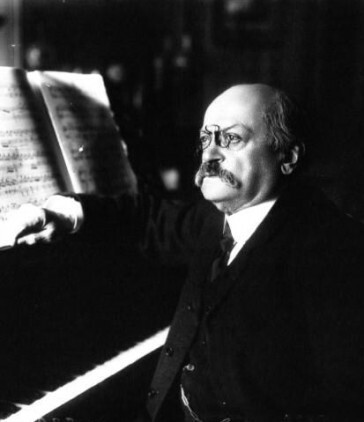 However, the dismal failure of Janot (1881), written after a period of illness and unhappiness, led to a split between the composer and his producer, and it was bruited about that Lecocq, accused now of turning out works which were all too much musically alike, might be on the downward slope. A change of venue, of producer and of cast, however, proved to be a salutary one and Lecocq, who had already had some lively success at other houses with his music for the vaudevilles Le Grand Casimir and La Roussotte (w Hervé, Marius Boullard) at the Variétés, and his accompaniment to the grandiose spectacle of L’Arbre de Noël at the Porte Saint-Martin, moved back into top gear with his next two pieces, Le Jour et la nuit (1881) and Le Coeur et la main (1882), both produced by Brasseur at the Théâtre des Nouveautés. Both, equipped with the kind of dashingly farcical libretti which suited him so well, were splendid successes which, like his earlier triumphs, were swiftly played throughout the world. Chivot and Duru’s La Princesse des Canaries (1883), which followed quickly on the heels of this pair of hits, had a more limited home success, but it, too, exported well, and the same authors’ L’Oiseau bleu also found some takers at home and abroad (San Francisco as The Red Bird, Amsterdam as Der Wondervogel) without ever looking like challenging the composer’s most popular works. Thereafter Lecocq, ‘very rich, in love with his art, cats and old books’, genuinely did become somewhat bogged down in his own style and, deprived by the depredations of time of the support of his (and everyone else’s) favourite authorial teams of Leterrier/Vanloo, Chivot/Duru and Meilhac/Halévy, the shows and scores he produced became less and less successful. Plutus, his first work premièred at the Opéra-Comique, was a failure, Les Grenadiers de Mont-Cornette disappeared in 18 performances at the Bouffes-Parisiens, and L’Égyptienne (1890) did even worse. Only one work, Ninette (1896), his version of the Cyrano de Bergerac story, had any kind of a run, but even it did not begin to approach the composer’s great works of the 1870s and 1880s. A master of the charming and even the beautiful in light theatre music — this last quality best witnessed by the melodies written for the hero and heroine of Le Petit Duc– Lecocq could also turn his hand to lustier strains, such as those of the celebrated Quarrelling Duet and `Marchande de marée’ in La Fille de Madame Angot, and to swirling dance music as epitomized in the waltzing finale to the second act of the same piece. His work did not in any way lack comical strains, but his musical turn of phrase in comic situations was always more genteel than the cheerfully vulgar and belly-laugh burlesque effects of such musicians as Hervé. It is perhaps this lack of very obvious colouring that has led to his works being disproportionately neglected in modern times where only La Fille de Madame Angot and, to a lesser extent, Le Petit Duc remain in the repertoire in France. Unlike Offenbach, Lecocq seems to have suffered but a little from the pastiche-makers down the years. He caused a great storm in the press when H B Farnie put together a ‘new Lecocq opéra-bouffe’ called The Black Prince for London, which may have been why another and much less talented British cobbler together of semi-borrowed pieces ducked his head a little ‘Austin Fryers’ produced two musical plays, The Japanese Girl (1897) and the 1-act Eulalie (1890), played by the Arthur Rouseby company (1895) on a triple bill with Cavalleria rusticana and Die schöne Galathee, each of which boasted a musical score by one ‘Charles Lacock’. The coq had become anglicisd and changed its gender, but I think there is little doubt as to the source of Fryers’ scores. A piece called Una (Dublin 5 April 1875), written by Harry Paulton for a short touring life, also sported a Lecocq pasticcio score. I own 44 sheet music prints from the 1870′s. La Fille de Madame Angot by Lecocq is one of them. The “paroles” are by Arban and the etching is by PAR (Renoir). Where can I evaluate this and the other in the collection. They are works by Offenbach, Gounod, Leduc etc….